Summer is here, which pretty much means that the go-to hairstyle will be to tie your hair up into a ponytail. Unfortunately, while it's a simple hairstyle that's easy to pull off, it can get a bit boring if you wear it every day, which is where braids come in. Braids are great because they can stand the heat and humidity, while making you look and literally stay cool without having to have to go through all the trouble of using your blow dryer or flat iron. Below are a couple of hairstyle ideas for adding braids to a ponytail that should help give you the perfect day-to-night hairstyle. Fishtail braids are probably the first thing that popped into your mind when it came to styling your ponytail, and you're not wrong. 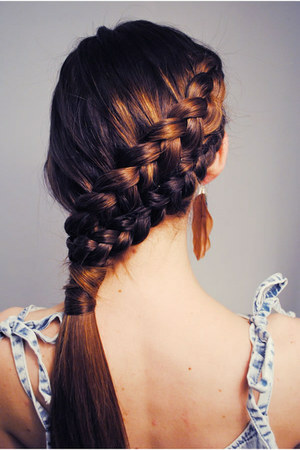 You can try upping the ante by making three mini ones, braiding them all together, and sweeping them up into a ponytail. It'll look something like this, which, as you can see, is a nice way to reinvent the fishtail braid look. Three-strand braids are the go-to ponytail braid for most women who like to do braids, but they're not exactly the most polished looking hairstyle. For a sleeker, tighter braid, add more strands and do a five-strand braid for a more professional look. The five-strand braid will look something like this. If you're sick and tired of going with a low-hanging, straight ponytail, French braids are the way to go. You can double on it and go with a double French braid that still looks just as good, albeit a bit more time-consuming to do. Here's a picture to give you an idea.